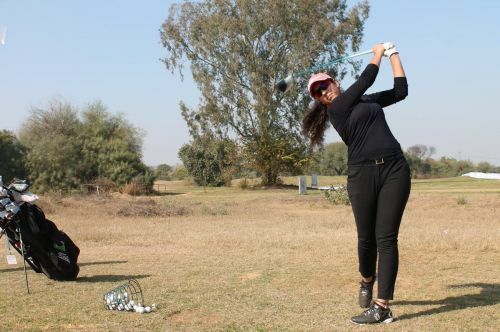 Gurugram, March 7 (IANS) Gaurika Bishnoi took a stranglehold on proceedings at the picturesque Classic Golf & Country Club, as she moved four shots clear at the top after the second round of the fifth leg of the Hero Womens Pro Golf Tour on Thursday. Gaurika, who is looking for her first win this season after coming close at the fourth leg in Ahmedabad where she finished runner-up, combined five birdies with three bogeys during the second round for a score of 2-under 70 and a total of 142, according to a statement. Neha Tripathi, winner of the inaugural leg this season in Pune, carded the only other sub-par round of the day (71) and is lying second at a score of 146. Three other golfers - Gursimar Badwal, winner of Leg 2, along with Siddhi Kapoor and Smriti Mehra, are a shot behind Neha at 147. Winner of the third leg in Ahmedabad, Ridhima Dilawari was a further shot behind in sixth place with a score of 148. Gaurika began the day with a bogey on the first hole, but bounced back in style with back-to-back birdies in the par-3 second and par-5 third holes. She slipped again at the par-4 seventh hole with a bogey but recovered quickly for a birdie on the ninth. In the back nine, another bogey in the tenth meant that she was again back at par. Playing steadily thereafter, she picked up a birdie on the fourteenth hole before finishing on a high with another birdie on the final hole. Neha Tripathi carded bogeys on the par-5 ninth and fourteenth holes, but also hit birdies on the second, seventh and the eighteenth, and would be happy to finish the day at 1-under 71 after her score of 75 in the opening round. The third group will see Ayesha Kapur, Jyotsana Singh and Khushi Khanijau, followed by Ananya Datar, Afshan Fatima and amateur Natalii Gupta. Ridhima Dilawari, Smriti Mehra and Siddhi Kapoor will form the penultimate group, followed by the leaders Gursimar Badwal, Neha Tripathi and Gaurika Bishnoi.